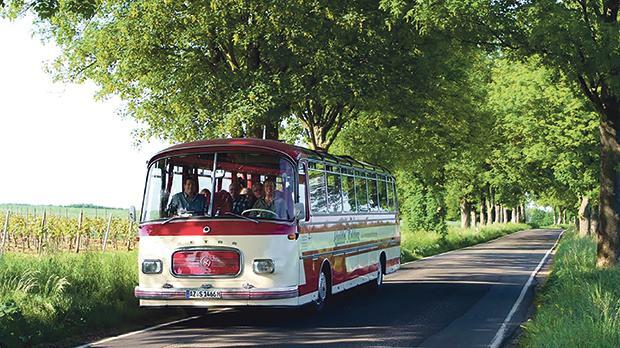 IBB Hotel Ingelheim’s residents on an excursion touring the region’s vineyards on a vintage bus. The IBB Hotel Ingelheim is the winner of the Best of Wine Tourism Award. The coveted prize was awarded by international network Great Wine Capitals. This special honour for the Mainz and Rheinhessen regions in the ‘Accommodations’ category was awarded to the IBB Hotel Ingelheim following its opening for business in the Rheinhessen wine metropolis in 2017. The prize is awarded annually to companies that are particularly outstanding in their respective region for wine tourism. A nine-member jury chose winners in seven categories – from fine food and wines to sustainability, art and culture. The interior design of the 109-room hotel reflects the Rheinhessen wine region: natural materials are mingled with images and stylistic elements from the world of wine. Offerings such as wine events with partner wineries in their in-house restaurant and excursions to the vineyards by vintage bus also include a top selection of regional wines. “It is a great honour that our IBB Hotel Ingelheim has been awarded this prestigious international prize. It is the perfect tribute to the creative, successful wine tourism activities of our team, led by general manager Michael Werner,” says IBB Hotel Collection managing director Vladimir Saal. The modern hotel in the centre of the historic city of Ingelheim am Rhein is one of the individual city hotels in the fast-growing IBB Hotel Collection. Strategically located just outside the Mainz/ Wiesbaden/Frankfurt and Rhine-Main metropolitan regions, the hotel features conference facilities. Its guests include business travellers and private visitors from Germany and abroad. Through its immediate proximity to the kING Culture and Congress Hall and the Ingelheim iCC Conference Centre, the hotel has established itself as an important hub for events in the region after just one year.